Let's go back to earth then and review the latest trends in this infographic followed by the 5 most powerful and successful marketing strategies to get your listing sold. Shall we? 80% of us go to Google when searching for anything - and that holds true also when house hunting. We'll talk later about how real estate portals, like Trulia and Zillow, are losing their edge proving this marketing strategy even more relevant for real estate agents. Notice this first marketing strategy reads Google Ads, not just Google, because of the level of competition in the organic side of the results - which is something we'll talk later on as well. To combat this, you can take the pay-per-click approach and use Google Ads and/or Bing Ads to rank at the top of the page. You can learn more about Google Ads in our article about the Google Ads platform. 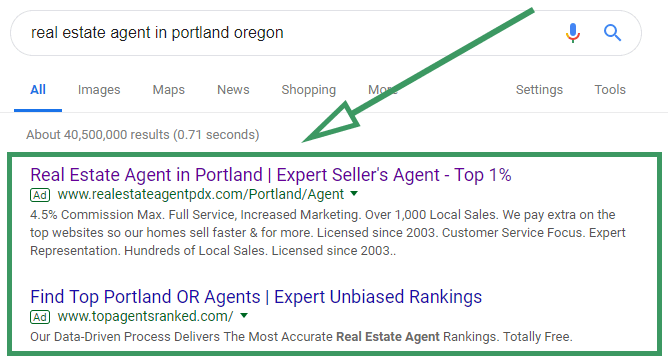 One campaign per location:Do you sell properties in Portland, OR and Lake Oswego, OR? Create two campaigns. One campaign per location where you have listings. One ad group per type of property: Do you have one-bedrooms single homes and two-bedrooms townhomes? That means you need to create two ad groups - one per type of property. Why not going for generic short-tail keywords? In one word: $20 USD per click. As a real estate agent you won't be able to outbid the marketplaces like Trulia, Zillow and the like. Try typing in Google the more generic Real estate agent in AnyTown. This is likely what you'll see - a bunch of marketplaces competiting among each other and willing to pay upwards of $20 per click. Seattle-based Zillow bought San Francisco-based Trulia in 2014 creating a real estate digital ad juggernaut. Love it or hate it - most real estate agents and brokers actually hate it, this is where over 150 million users per month go to house hunt. This second marketing strategy then, comes from reality more than from being ideal given the great degree of control that marketplaces are trying to impose, making real estate agents less relevant. Given that controversy behind its Premier Agent business model and recent setbacks in New York and Los Angeles, marketplaces face increase scrutinity and have become a less attractive acquisition channel. We keep marketplaces on the second spot, however, pending new devlopments that justify relegating it to a lower position. We see how the web traffic for both Zillow and Trulia is decreasing - is it seasonal? is it a trend that signals a change of consumer behavior? We'll update this information on a quarterly basis. (Source: similarweb.com). 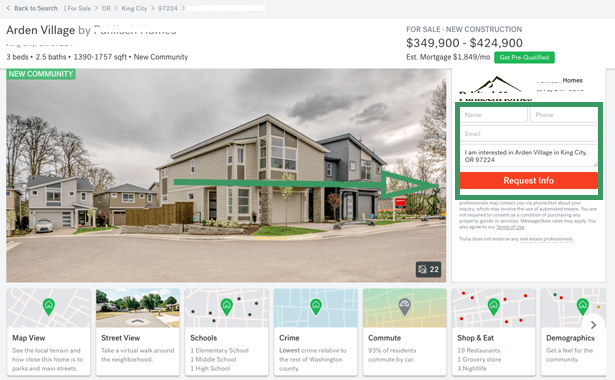 Facebook Marketplace added a Housing section which allows individuals to list their property listings for sale or for rent. Facebook has partnered up with Zumper, Apartment List, and other third-party sources to add hundreds of thousands of property listings. 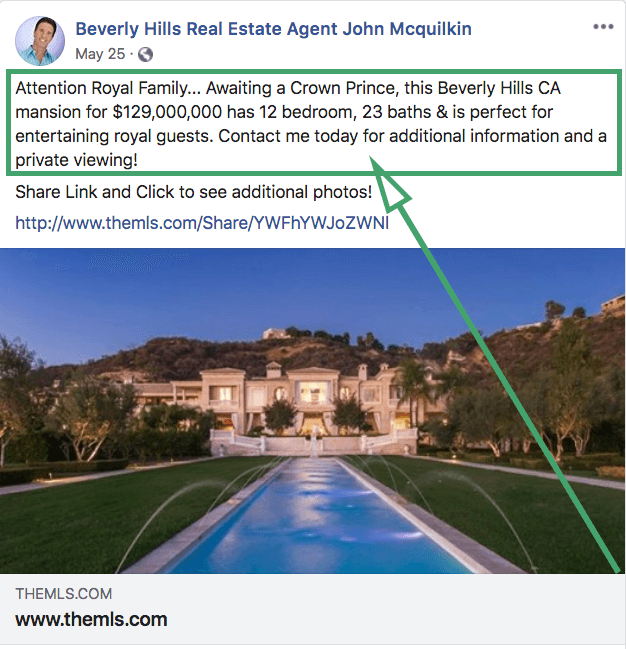 Facebook is a very powerful tool - use it wisely and make every single one of your listings unique. As you can see in the example below, the real estate agent doesn't just list another property, he doesn't throw the property features but rather he makes it memorable and unique. Facebook also provides a great window to become the local reference of what is going on in your are of influence. Specially for prospective buyers who are not local, mixing news with listings is a great way to have a growing and loyal following base. As you can see below, the post has nothing to do with housing but about the community. As you know, LinkedIn is the leading platform for professionals looking to build their network with others in the same industry. Use this platform to establish your professional reputation online as well as gain exposure to investors and bankers, etc. On your profile, add your accomplishments such as awards received, education, background, skills in social media, real estate transactions, etc. It provides robust marketing and engagement through discussion boards, private messaging, and even blogging. 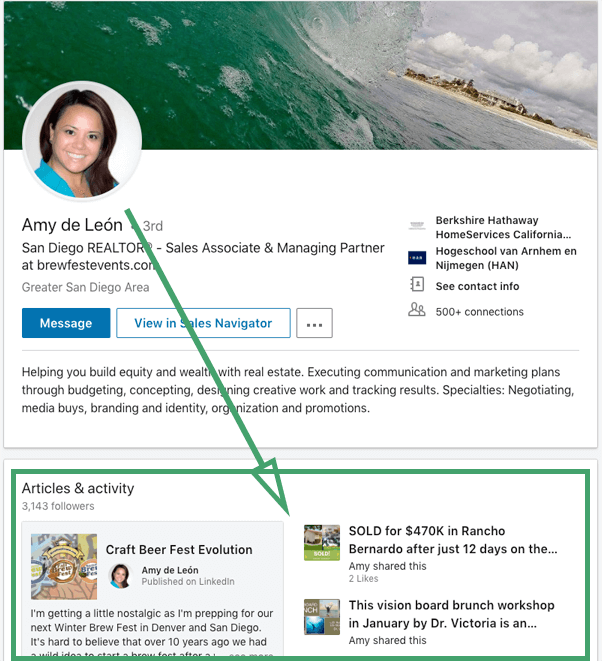 Make sure your profile highlights your recent activity and you share as well any external links that are relevant to your area of influence, accomplishments and expertise. Build your LinkedIn network to generate real estate leads by joining groups related to real estate such as your real estate association, Multiple Listing Service (MLS), etc. By contributing to discussions, you are marketing yourself each time you post. You could also look for professionals outside your groups like lawyers and financial planners who could make referrals. 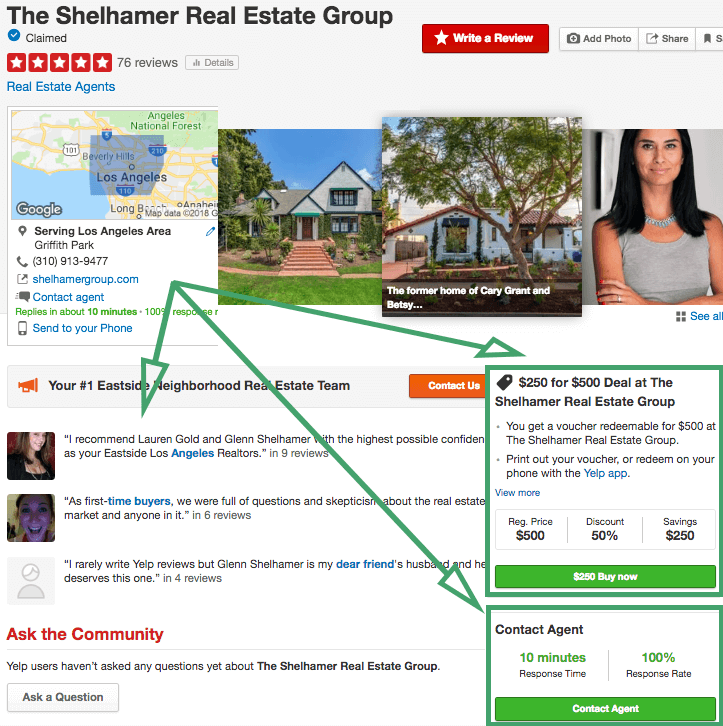 LinkedIn also has a tool called ProFinder that connects users with a freelance real estate agent that matches their needs. Yelp is the place where reviews happen - and as a real estate professional, reviews can boost your credibility and help you land additional leads. It is important to keep an updated and complete profile showcasing your offerings as well as adding Yelp's feature called Contact Agent. As the review platorm it is, addressing reviews - whether good, bad or neutral - in a professional and gracious manner is key to gain more leads. 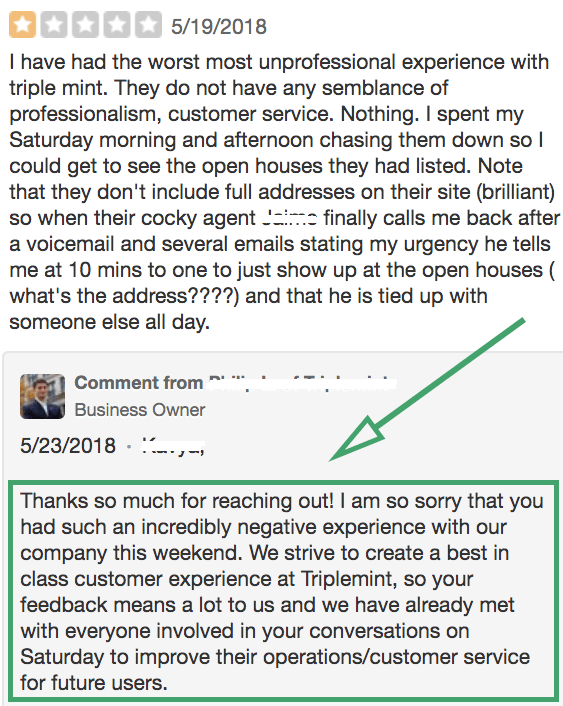 Below you can see how this real estate agent addresses a bad review in a very gracious fashion which makes the business look professional and minimizes the negative effect of the review itself. Companies that use videos in their marketing have 27% higher click-through rate and 34% higher conversion rates than those that don’t. Videos under 90 seconds see an average retention rate of 53% whereas, videos over 30 min retain only 10%. If you want your property listing to stand out against your competitors, then invest in listing videos to better showcase the property’s key features. Real estate agent Judy Weiniger is a video pro and leverages this channel like few other real estate professionals - she created a listing video with a great narration and stunning video movements to showcase the beauty of the home. When listing the reasons why buyers should check out the property, she creates a visual image through her narration that helps buyers envision themselves living there. Judy also touched a little bit on the surrounding neighborhood in her video, but we’ll go more in depth for neighborhood/community videos in the next bullet point. One factor that home buyers take into consideration when making a purchase decision is the neighborhood and community around the listing. The property could be absolutely gorgeous with a spacious living room, a beautiful kitchen, and a swimming pool, but if for example your target market is a growing family and they see that the local school is too far from the house for their kids, then you may not entice them to see the property in person. Create an imagery of the area and its surrounding shops, schools, club, etc. to further help potential buyers see themselves living in that neighborhood. Provide facts and history of the city or town so the prospect can get an appreciation for it. Marguerite Martin, a Tacoma realtor, made a thorough video on the South Tacoma neighborhood. She went in-depth with the history, parks, local businesses, and historic homes. She highlights the uniqueness of the community, the diversity of homes, the benefits and opportunities if provides. The way she explained the history of South Tacoma really entice the viewers. You can see that she knows her stuff and has placed herself as an authority figure and a main information resource for the Tacoma area. This gives prospect a sense of ease and trust that they can rely on this realtor. Hearing from past clients with a positive experience working with you, gives future prospects an idea of what they can expect. Prepare questions that would highlight your qualities as a real estate agent and traits that buyers and sellers are looking for. Asks questions such as “why was I chosen to represent your home purchase”, “describe your experience working with me”, and “what did I do best to help with your home search?”. Marguerite Martin did a nice short video of this. Marguerite used client testimonials as her introduction video which is a great way to leave a positive first impression. Her past clients highlighted her qualities that made their experience a positive one. A video bio allows real estate agent to communicate their goals, demonstrate their interpersonal style, and even include brief testimonials as to add credibility. Take this chance to explain who you are, your background, certifications, achievements, sales history, mission, etc. A bio video allows you to be more approachable. When viewers are hearing your voice and seeing your face, they get a sense that you are a real human and someone they could relate to. Boutique Real Estate Group did an amazing job on their “About Me” video. They provided interesting and useful information for the audience and utilized music, imagery, and vocal tone to convey their passion for their work and dedication to their clients. Share your wisdom and engage with your viewers with how-to and Q&A videos that would make their home buying/selling process much easier - chances are this is their first time and have many questions about it. When giving your expert opinion, provide valid reasonings to support your statements. This also allows your viewers to understand where you’re coming from. Santa Barbara Realtor, Stephanie Young provided a great example of this. In the video below, she talks about the factors sellers should consider when choosing a real estate agent such as the real estate agent’s marketing techniques, the location they advertise in, negotiation skills, etc. She provided her expert opinion with reasonings that will resonate with viewers. Videos generate more than 1,200% more social shares than text and images posts. Video marketing on social networks also improve your website’s SEO by driving them to your homepage which is a huge bonus! E-mails that have a video embedded in them receive an increase click-through rate by 96%. The goal is for users to stay on your website. The more they spend on your website, the more things they will learn about you and your business and that will lead to more conversions. Similar to blogs, when you put helpful resources in your newsletter for your existing clients, you can gain new ones because the content you put in it is so valuable, your current clients will share it on social media or pass it along to their friends and family who in turn could be a potential new subscriber. Recipients are 75% more likely to click on emails from segmented campaigns than non-segmented campaigns. 86% of users prefer receiving a promotional email at least once a month, while 15% of users say they wouldn’t mind getting promotional emails every day. ― Content: Now that we know how often to send them, let's see what to send based on a thorough analysis we've done on successful real estate e-mail marketing campaigns. Homeowner tips: Share with your leads useful home advice based on your experience or on seasonal newsworthiness. For instance, you might delve into gutters maintenance or in interest rates if there has been a change in the official rate. One very important benefit from these emails is that they will be likely shared, so you're gaining additional exposure. In addition, you remain connected with your lead. Share your listings: This one is a given! While the homeowner tip email was meant for leads, for homebuyers, this email can also be sent to other real estate professionals. Now, we see the power of segmentation! Embed in this email a video following what we talked about previously regarding videos - this will definitely knock it out of the park. Request referrals: Hey, after all, if you don't ask you don't get. Asking for referrals from your clients and offering an incentive for those being referred is a great way to stay relevant and to gain additional exposure throug email sharing. 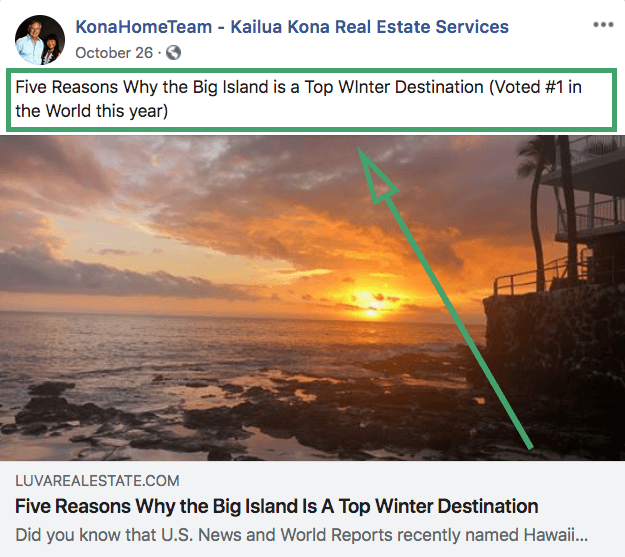 These five marketing strategies for real estate professionals will help you acquire leads and turn them into customers because they are proven to work. As the industry becomes more and more competitive, it is increasingly important to remain focused and invest time only on marketing strategies that work. 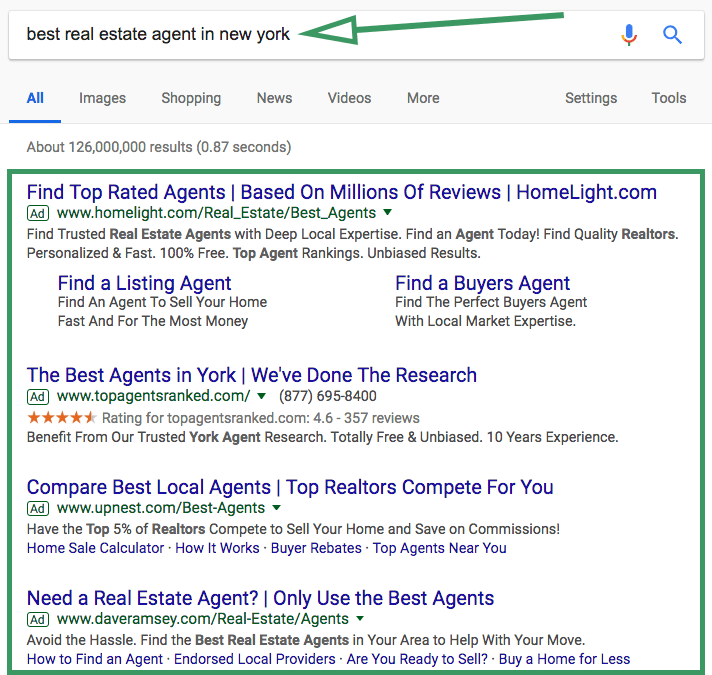 Now that you're becoming an expert in all-things-marketing when it comes to real estate, we suggest reading this article which will make you an expert on all-things-marketing when it comes to Google, which is part of the first strategy and it is worthwhile to delve into: How to rank higher on Google. With Kolau Small Business gain more from Google Ads while paying less. Kolau’s optimization engines enable advertisers to remain in full control of their account while Kolau automates their Google Ads account 24/7. Gain more and spend less. Let’s go!